I received a copy of this chart from the 3rd Annual DFW TW Stitching Get-Together held at The Stitchin' Post in Plano, Texas. Jackie, the owner, had contacted Teresa and requested something special. Teresa autographed some printed copies of her free chart, and sent them to Texas for each attendee of the get-together. Determined to be one of the first people to finish him, I started stitching madly on July 22, 2001. I lost some steam after the first week and ended up not finishing him until August 11, 2001. 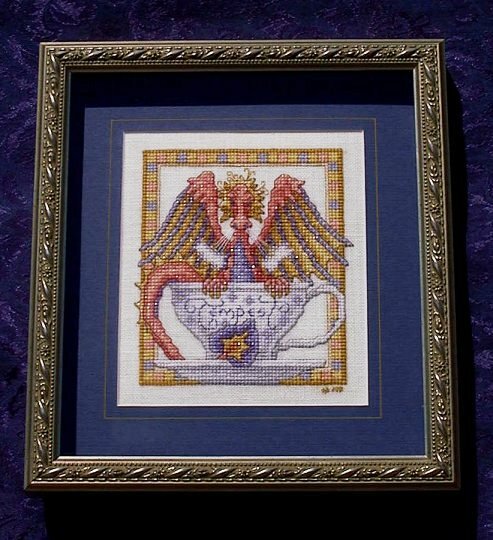 This is one of the first pieces I ever stitched without a color model for reference. It was really interesting to watch the colors develop especially since they were such unusual colors for a TW dragon. 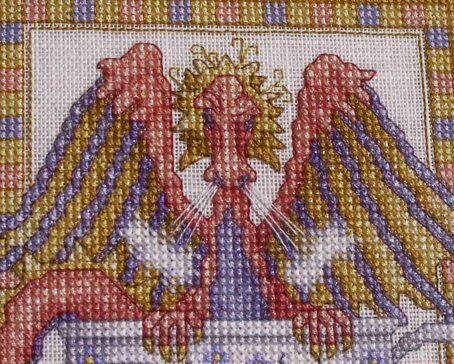 After completing the piece, I used a clear Prism thread to highlight the dragon. Up close, he has a very light sparkle. He does look quite put out about only being able to breath steam instead of fire. But, he is a cute little thing. As usual, Dan Melvin at Matte Ink , framed the piece. I did this in a true shadow box with a dark purple frame. Luckily, it works quite well in our newly remodeled kitchen. The purple is so dark it almost matches the navy wallpaper on the bottom of our kitchen.